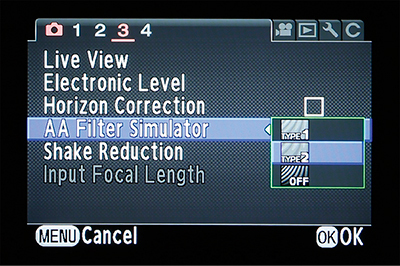 Like many recent cameras, Pentax has opted to not use an anti-aliasing filter in the K-3. For those who have managed to miss the coverage of how these filters work, they are designed to minutely blur the light reaching the sensor to help reduce moiré pattering. The result is a slight blur in the final digital image. By not using this filter, images are crisper and resolve more detail, but they are also prone to suffering from more moiré patterning when photographing close-knit patterns, such as distant netting or brickwork, or more obviously patterned clothing. To combat this, Pentax has come up with an ingenious solution. The same motors that move the sensor slightly when stabilising it are employed to shift the sensor the width of a pixel or two during an exposure. There are actually two settings in the K-3’s menu controlling the anti-aliasing filter effect. The first of these moves the sensor back and forth along one axis, while the other moves the sensor in a more circular fashion. The second of these settings produces a greater anti-aliasing effect, although obviously this reduces detail more. As the anti-aliasing feature is applied electronically, via the sensor motors, it means that photographers have the advantage of choosing whether to employ the anti-aliasing feature depending on the subject they are photographing. For example, when shooting portraits or fashion images, you might want to apply the filter effect to prevent any moiré patterning emerging in fabrics; landscape photographers, on the other hand, might leave it switched off to reveal every last detail in a scene. To test the anti-aliasing filter effect, I photographed a pair of jeans turned inside out, as the fabric weave is usually ideal for demonstrating moiré patterning. Surprisingly, to create any moiré patterning, I had to stand around 4m away from the jeans and use an 18mm focal length. If I stood any closer, the high resolution of the camera meant that all the weave of the fabric was clearly visible with no artefacts. Using the anti-aliasing filter effect did indeed remove the moiré patterning, although this was at the expense of detail. Given the resolution of the K-3, I would suggest that most photographers could quite happily leave the anti-aliasing feature turned off unless they are specifically aware of something in the scene that may cause moiré. For example, if you are photographing portraits or, say, fabrics with repetitive patterns (like those you might find in a Moroccan souk), then you would be wise to switch the anti-aliasing feature on.